Samsung Galaxy Watch, which was launched by the South Korean giant alongside the Galaxy Note 9 in New York has also made its way to the Indian market. The new Galaxy Watch, which comes as a successor to the Gear S4 flaunts a circular display and an always-on screen. Protecting the watch is Corning Gorilla Glass DX+ panel, and the watch comes with a 5 ATM rating meaning that it’s also highly water resistant. The Samsung Galaxy Watch comes with Tizen OS and a rotating bezel UI. The watch also features analogue like ticks and hourly chimes which give it a feel of the traditional watch. Besides facilitating heart rate monitoring through a built-in sensor and a dedicated stress management tracker, the watch features depth effect lending it some beautiful design. The Samsung Galaxy Watch goes right up against the Apple Watch series, and it comes with dust- and water-resistant built proven by the IP68 rating. The durability of the watch has been certified by MIL-STD-810G rating. The watch features stress management and tracker which offers breathing exercises while it detects higher stress. Additionally, Samsung has also provided a sleep tracker that detects REM cycles and other sleep cycles to help users monitor their sleeping patterns. The Samsung Galaxy Watch also offers 59 workout profiles including 21 new indoor exercises. Combined with the Samsung Health App, the watch will allow the users to practise better calorie management. The Samsung Galaxy Watch runs on Tizen OS 4.0 and features a Circular Super AMOLED panel along with an Always On Display and Corning Gorilla Glass DX+ protection. On the inside, the watch packs a dual-core Exynos 9110 SoC, paired with 768MB of RAM and 4GB of onboard storage. The sensors on the watch include an accelerometer, ambient light sensor, barometer, gyro, and HRM. 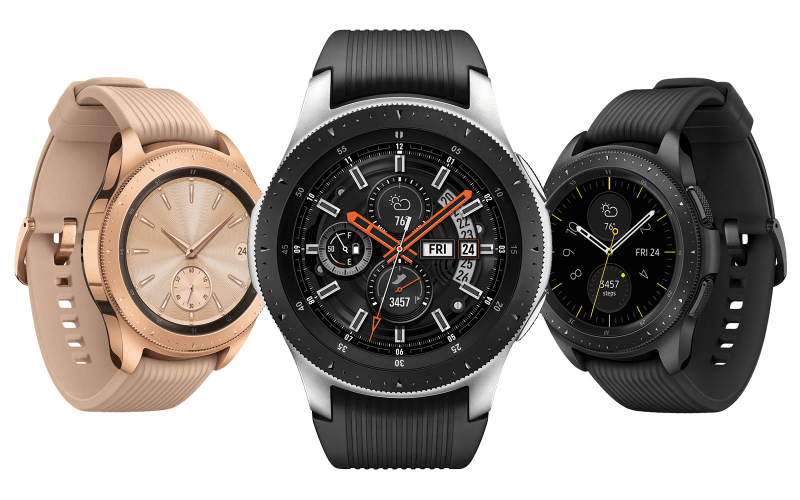 The connectivity options on the Samsung Galaxy Watch include Bluetooth v4.2, Wi-Fi 802.11 b/g/n, NFC, A-GPS/ GLONASS. The watch also supports WPC standard-based wireless charging, and it is compatible with devices running minimum Android 5.0 or the iPhone 5 and later based on iOS 9.0. The 42mm variant of the Samsung Galaxy Watch sports a 1.2-inch Super AMOLED display with 360×360 pixels resolution and a 270mAh battery. The dimensions of this model measure 41.9×45.7×12.7mm and it weighs 49 grams while supporting 22mm interchangeable straps. Contrary to that, the 46mm variant flaunts a 1.3-inch Super AMOLED display along with a 360×360 pixels resolution and a battery of 472mAh. The dimensions of this model measure 46x49x13mm, it weighs 63 grams, and it supports 22mm interchangeable straps. The Samsung Galaxy Watch will start retailing in India for Rs 24,990 for the 42mm version, while the 46mm variant will bear a price tag of Rs 29,990. The watch will go live for sale in mid-October through via all authorised retail channels in the country. In India, the company has only announced the Bluetooth only models of the Samsung Galaxy Watch, and there has been no update about the LTE version of the watch. The 46mm variant of the Galaxy Watch will be up for sale in Silver body design, and it will also be available in Onyx Black, Deep Ocean Blue, Basalt Grey options for interchangeable straps. The 42mm variant, on the other hand, will offer Midnight Black and Rose Gold body as colour choices, while providing Onyx Black, Lunar Grey, Terracotta Red, Lime Yellow, Cosmo Purple, Pink Beige, Cloud Grey, and Natural Brown interchangeable straps.